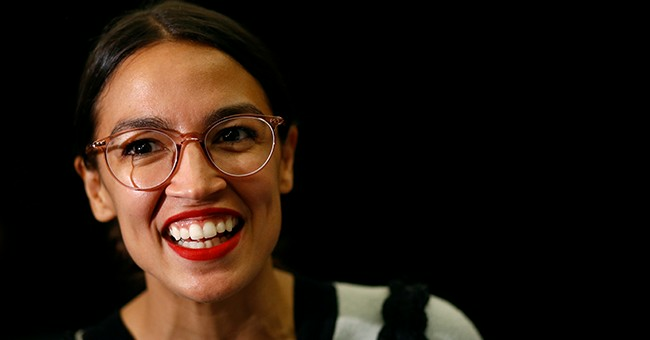 Oh, the heck (by which you know I mean something stronger) with it, inasmuch as what we see playing out before us -- never mind the president or the House speaker or Alexandria Ocasio-Cortez -- has timeless qualities. The push to control in the face of resistance is the oldest chapter in the human narrative. Neither Bernie Sanders nor AOC invented it. They merely took the raw material of human existence and molded it for contemporary uses. Thus the Green New Deal. Thus the push for Socialism, etc. Yawn. I don't mean "yawn " in the sense of how simply borrrring, dah-ling, to face the prospect of a government assault on liberty and human rights, in the name, paradoxically, of liberty and human rights. I mean it's still the same old story, a fight for love and glory, because this is what we humans do and always have done -- and presumably always will. It's Bill Murray and a thoroughly politicized "Groundhog Day": the endless cycle of "Let's pull the rich down" followed by the realization afterward (compare to Napoleonic France) that we're still messed up as a society, only in new ways, given that pulling down the rich never produces anything but immediate gratification for the inciter of the deed. Redistribution has never, anyplace, had everything -- or even very much -- to do with lifting up the downtrodden. Basically, the instinct arises from an enduring, as opposed to endearing, human trait known as jealousy: the desire to feel better, personally speaking, through relieving the supposedly undeserving of their means and possessions. We could call it the take-that-you-bum school of political philosophy. Kick the rich, raise their taxes, distribute the proceeds to the more-deserving. That sort of thing. A great irony of the present furor over socialism is that the richest of the rich are "progressive" themselves, if usually in milder degree -- Zuckerberg, Bezos, Soros, Buffett, Steyer, Bloomberg and so forth. Are we proposing that progressively inclined folk, as well as black-hearted conservatives, throttle back their capitalistic instincts? Current stories about Bezos', er, family entanglements note that he and his now-estranged wife started Amazon in a garage, working 12 hours a day, seven days a week, packing and mailing the books to be shipped: most significantly, seeing and doing something no one else had, up to that point, seen or thought of doing. I am no great fan of Amazon, but I acknowledge that it comes in handy at times. And besides, what are we going to do, set up a government panel to judge the social utility and, therefore, the acceptability of new ideas? That is what socialism -- rule by self-appointed experts like Sanders -- comes to in the end. Socialism offers a single choice: submission. Or maybe physical flight -- until the time comes that sensible people figure out, as now is happening in Venezuela, that socialism is for the buzzards. We could probably dismiss the socialist dream -- or nightmare -- inasmuch as four years of a Sanders presidency with AOC as treasury secretary, Kamala Harris as attorney general and Beto O'Rourke as chairman of the Federal Reserve would flop resoundingly. And others, limping forward, would pick up the pieces. We know this because socialism always fails -- unless modified, as in Scandinavia -- to take account of the human preference for some measure of choice. Being ordered around, and kicked around, by Bernie and Alexandria is only for now -- the present media cycle -- much of an electoral prospect to discuss. No rootin'-tootin', rumpled and rumple-minded socialist seems capable of persuading Americans that theft-by-government decree trumps (as it were) the American gift for invention and experimentation. I'm generally not up for scattering pellets of good advice around Democratic headquarters. Here's one anyway: The party of Andrew Jackson and Grover Cleveland and Al Smith needs to cut loose the socialists currently pulling their wagon and hitch up a donkey of the old-fashioned kind -- say, a Harry Truman, a Hubert Humphrey or Henry "Scoop" Jackson. Lord knows, maybe even a Bill Clinton.